Situated in Alipurduar Sub-division of Jalpaiguri district in West Bengal is about 124 km from Siliguri. This sanctuary was constituted in the year 1941 for the protection of Wild Life, particularly one-horned Rhinoceros (see the picture above), an animal threatened with extinction. River Torsha runs through the sanctuary. The forest is mainly savannah covered with tall elephant grasses. The wildlife, in addition to one-horned Rhinos, consists of Royal Bengal Tigers, wild Elephants, Deer, Sambhar, Barking Deer, Spotted Deer and Hog Deer, wild Pig, Bisons and a number of Birds, Peafowls. Totopara: 30 km from Madarihat, a small village on the banks of the river Torsha near Bhutan border is the only habitation now of the Dooars aboriginals - the Totos. Their number was dwindled to less than a hundred a few years back. A tea garden near Banarhat also bears the name Totopara, probably a survival from days when Toto settlements were more numerous. The journey to Tototapara is quite exciting crossing wide rivers dried up and without any bridges. 30 km from Madarihat, a small village on the banks of the river Torsha near Bhutan border is the only habitation now of the Dooars aboriginals - the Totos. Their number was dwindled to less than a hundred a few years back. A tea garden near Banarhat also bears the name Totopara, probably a survival from days when Toto settlements were more numerous. The journey to Tototapara is quite exciting crossing wide rivers dried up and without any bridges. The name "Buxa Tiger" has been derived from Buxa Fort (a fort at an altitude of 867 metres on the Sinchula Range guarding the most important of the eleven routes into Bhutan), which once was used for detainees during freedom movement of India. This Tiger Reserve comprises the forest area of Rajabhatkhawa, Nimati, Barobisha, Rydak, Raimatang Jainti, Buxaduar and Bhutanghat. The main rivers are Sankosh, Raidak, Jayanti, Churnia, Turturi, Phashkhawa, Dima and Nonani. Area of the Tiger Reserve is 759 sq. km. with a core area of 331 sq. km. Buxa Tiger Reserve was set up in the year 1982-'83, which later in the year 1992, January, was declared a National Park. 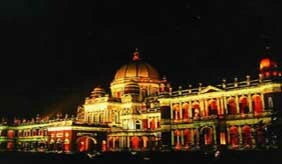 Other places of attraction in and around the region include Jainti (30 km from Alipurduar), a beautiful spot encircled by Jainti River and hills around; Bhutanghat (45 km from Alipurduar), famous for scenic beauty beside River Raidak bordering Bhutan and Rajabhatkhawa (15 km from Alipurduar), attractive for the nature information centre as well as for its natural beauty. Idealised from the concept of classical European style of Italian Renaissance, this magnificent palace was built by the famous Koch king Maharaja Nripendra Narayan in 1887. Raised on a base of 1.5 metres in height, this double storied brick building covers an area of 4768 square metres. It extends 120 metres from north to south and 90 metres from east to west. The frontal facade consist of a series of arches resting by an alternate arrangement of narrow and broad piers to contain single and double Corinthian pilasters respectively. Situated in the heart of the Cooch Behar town. Constructed by Maharaja Nripendra Narayan during 1885 to 1889. Deities of Lord "Madan Mohan", "Ma Kali" , "Ma Tara" , "Ma Bhavani" adorn the campus. On the occasion of Rush Purnima the traditional Rush Yatra along with Rush Mela , one of the biggest festivals of North Bengal, is celebrated every year in Cooch Behar. 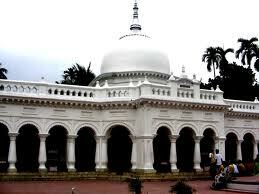 Baradevi Bari: Situated at Debibari of Cooch Behar Town. Idol of Goddess Durga is installed inside this temple which has the influence of European architecture. Durga Puja at Debibari is of major attraction during Saradotsav. Sir Mihir Goswami take over the charge of Chairman of NBSTC on 01/07/2016. A.C. Bus operation introduced in Alipurduar - Siliguri Route. Sri Sourav Chakraborty, take over the charge of Chairman, NBSTC on 11/ 06 /2015..